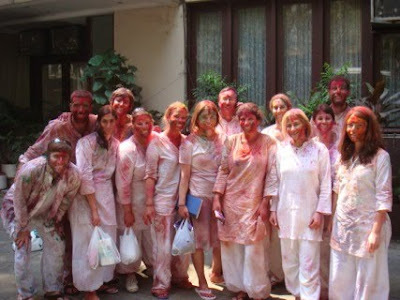 Traditionally (and to over-simplify it), Holi is a holiday celebrated by Hindus and Sikhs to commemorate Prahlad triumphing over failed attempts to kill him. 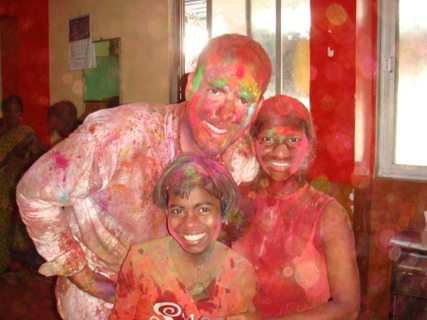 In India, it’s also a chance to have a raucous good time literally throwing and smearing brilliant-colored paint and water onto friends and strangers alike—pedestrian beware. 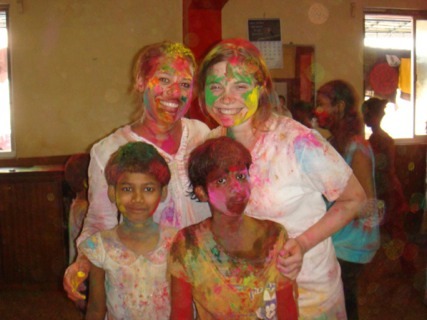 For me, Holi was an opportunity to be a kid again, and most poignant, to peek into the lives of a few dozen vibrant girls aged 4-17 who formerly lived in Dharavi, one of the largest slums in Asia. Now they live just a few feet away in an organization called Social Change for Girls, a haven of sisterhood, education, health and even technology. For instance, I was blown away when their program director asked them how many of them have Facebook profiles, and a dozen of their obedient hands shot up in the air. I’m already e-pen pals with one of the girls. It was here, with these wonderful girls, where we were brutally assaulted from all sides with powder paint. We ran circles around each other inside the small room we were in. 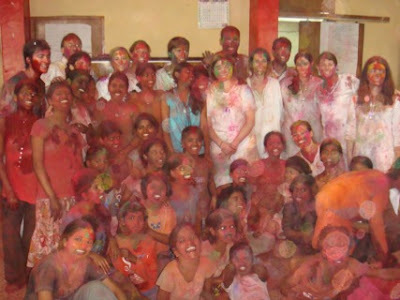 Everyone was armed with at least a handful of paint powder wrapped up in a pouch made of newspaper. 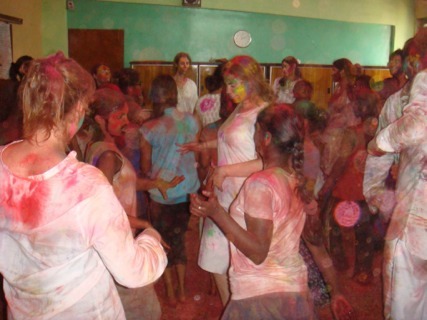 Some girls ran around, happily shrieking and throwing the paint, while other girls stopped to gingerly, caringly rub paint on our cheeks, forehead and hair. Our satchels of paint finally ran out after an hour. By then, the floor was covered with a generous layer of paint powder. We plopped down on it and the program director shared the background of the organization, and then our Access group asked questions directly to the girls about their everyday life. The girls’ responses reflected extremely well on the work of the organization, and it struck me that they are so happy, even though they have some of the toughest backgrounds. The Holi fun continued on the streets after we left Social Change for Girls. Even the cows and goats roaming the streets fell victim to rogue paint throws, their fur splashed with colors. It truly was a day I’ll never forget.